I am a frequent speaker on the topics of public relations, social media and brand journalism/content marketing. Due to my experience and subject-matter expertise, I have also spoken on innovation, health information technology, obesity prevention and leadership. Presentations, workshops and trainings are custom designed with your audience in mind. Interested in learning more? Email htpotter (at) me.com. Invited to a lunchtime briefing for the corporate communications team at Levi Strauss about how brand journalism and content marketing can support earned media strategies. Spoke with students in the graduate-level introduction to PR class about the intersections of paid, earned and owned media. Outlined how social media, brand journalism and content marketing can drive engagement. Shared how Kaiser Permanente used broad-scale public education efforts to raise awareness and influence health behaviors. Our Media Dashboard — The Latest and Greatest? Joined Jason Willet to share best practices for traditional, digital and social media measurement and evaluation. Spoke about the development of share.kp.org and strategies for developing brand ambassadors, which requires understanding the interests and needs of each audience with whom you are trying to connect, and offering content for each. Spoke about the launch, development, and operation of their new online platform, share.kp.org. Presentation explains how brand journalism and content marketing to increase brand awareness among consumers and thought leaders. Joined a panel to discuss the importance of the brand experience in meeting customer expectations. Invited by Scott Young, MD (@scottyoungmd) to speak to students in the Cal School of Information about brand management in a digital environment. Joined Mark Ragan (@MarkRaganCEO), Maria Poveromo (@mariapoveromo), and Sam Hosenkamp (@SamHosenkamp) to discuss and present proven solutions for providing metrics, ROI and KPIs for your social media to persuade the social media skeptics in the C-suite. Spoke with students in the graduate-level introduction to PR class about social media at Kaiser Permanente and how it is integrated into the public relations strategy. Joined a panel of experts to discuss the Affordable Care Act and the required shift to consumer-focused public relations. Joined an interactive panel on knowledge generation and care improvement. My remarks focused on communicating the advantages of health research to patients and the general public. Shared best practices for consumer engagement in health care. Focused on strategies for cultivating physicians and patients as trusted messengers for the brand. Spoke to the European Healthcare Congress about strategies for using social media to engage health care consumers. Joined Catherine Hernandez (@cbhernandez) to discuss how Kaiser Permanente uses social media and interactive communications strategies to engage employees, members and other stakeholders. Joined a panel to show you how to set appropriate key performance indicators for your particular organization; determine which metrics to measure (and how often); integrate traditional and social media metrics; and more. Provided a peek into the design of the Kaiser Permanente Center for Total Health. As a place to talk about health, the new center became a place to convene industry experts to talk about the future. How to use Facebook to score coverage, motivate your fans and engage the media. A panel discussion on the best practices for using Facebook as a brand. Introduced the Kaiser Permanente Center for Total Health blog http://centerfortotalhealth.org/blog/ through an in-person and online discussion with health bloggers and online advocates. A panel discussion on the best practices for using Facebook as a brand. Delivered opening keynote highlighting Kaiser Permanente’s journey to use health IT to improve quality and patient-centered care. Joined Tom Hoehn (@tomhoehn), Adam Christensen (@adamclyde), and Chris Boudreaux (@cboudreaux) to discuss the importance of social media policies. Led a table-top workshop for nonprofit communicators on the intersection of traditional and digital media. 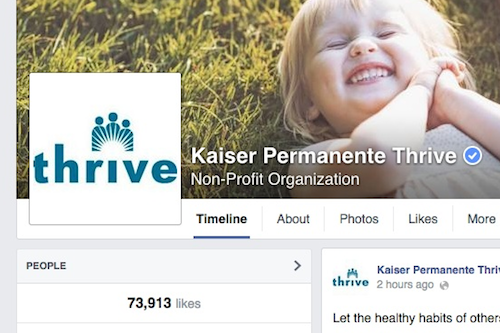 After winning “Digital PR Team of the Year,” discussed how we built the team at Kaiser Permanente. Specifically discussed the traits and characteristics for succeeding on the team. Joined Jennifer Cisney (@ljc), Eastman Kodak Company to discuss best practices for integrating social media into your PR strategy. Joined Vince Golla (@vincegolla) to discuss the Kaiser Permanente journey to use social media to promote and protect the brand. Joined Christina VanDunk (@cmcvd) to share how Kaiser Permanente uses community engagement, partnerships, health IT, and public relations to address childhood obesity. Working in a highly regulated field, reputation management in social media can be challenging. I joined Nancy Cartwright (@nbcartwright) to discuss how Kaiser Permanente used social media internally and externally to promote and protect the brand. Joined my physician partner, Ted Eytan (@tedeytan) to discuss how our work in health IT informed our social media engagement strategy. Participated on a panel comprised of technologists and advocates to discuss digital health solutions. Focused on consumer expectations and the challenges of adoption among clinicians. Joined a panel of communicators from the insurance industry to discuss best practices in social media engagement. Joined Ted Eytan, MD, MPH, MS (@tedeytan), Dave DeBronkart (@epatientdave) and Regina Holiday (@reginaholiday) to discuss the challenges and benefits of engaging patients through digital and social media. Spoke on a panel of corporate social media leaders moderated by Giovanni Rodriguez (@giorodriguez). Discussion focused on the risks and benefits of social media at the enterprise level. Delivered the closing keynote of the conference with my physician partner, Ted Eytan, MD, MPH, MS. We spoke about our partnership and our journey to engage the enterprise in social media efforts.